The Quamar E13E Grinder is a premium choice for heavy traffic environments. Users who use it in a small environment like home or office will benefit from the big burrs to dissipate heat very quickly and that improves clarity. The mini-steps on the grind setting makes adjustment very easy and convenient for users. It can be used for commercial environments to produce up to 5kg of powder a day. 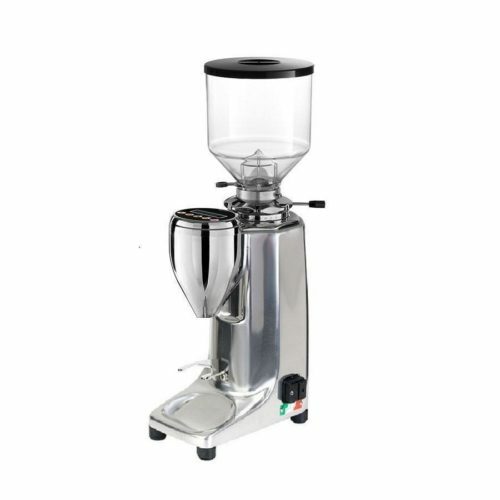 It is an excellent choice for cafes as the main grinder. The 75mm size should last approximately 1100 KG before replacement is required. The Quamar Q13E Grinder has an electronic timer to dose the amount of coffee needed according to the duration set, program to an accuracy of up to 0.05 seconds. With the measuring scales, the user will have a reading to what grind setting he prefers. The Quamar Q13E Grinder is pack with high-end features for a typical commercial environment and will definitely benefit in any smaller usage environment. The Quamar Q13E Grinder comes with a 1.2 KG hopper and can be changed to a 500 grammes hopper if required. The user can quickly remove the hopper and can put the excess beans back to storage.